Perdido Key, Florida was discovered by the early Spanish settlers in 1963, and its name literally means “Lost Key”. Bridges connect Perdido Key to Florida’s mainland, as well as Alabama. The white sandy beaches and the warm blue water of Perdido Key are those that you imagine when you think of a beautiful tropical vacation. 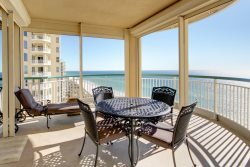 With endless entertainment, dining, shopping, and adventure, Perdido Key is a popular vacation spot - and for good reason. Perdido Realty Vacations makes it easy for you to book your accommodations and plan your upcoming getaway. Use our Perdido Key map on this page to explore the surrounding areas, and get driving directions to Perdido Key from nearby towns and airports. Turn left on Rt. 113. Turn right at the light where 113 ends at a “T” intersection. Go down the hill to the next light, Hardees on left. Turn left on Pine Forest Road (SR297) Milestone subdivision on your right. Turn right on Blue Angel Parkway (SR173) Travel south approximately 12-15 miles. Turn right on Sorrento Rd (SR292), at Walmart. Continue 5.1 miles, cross the bridge, travel 1.4 miles to Perdido Realty on the right (sign above entrance). Turn right on Blue Angel Parkway (SR173). Travel south approximately 12-15 miles. Turn right on Sorrento Rd (SR292), Walmart on corner. Continue 5.1 miles, cross the bridge, travel 1.4 miles to Perdido Realty on the right (sign above entrance). Turn left on Highway 182, cross the AL Bridge. From the FL/AL, line travel 4.8 miles to Perdido Realty on the left (sign above entrance). Driving south on Highway 59. Cross the Intracoastal Waterway to toll booth just before the “T” intersection at Canal Rd. Turn left on Canal Rd. Turn right at the fourth light.(SR161). Cross the AL Bridge. From the FL/AL, line travel 4.8 miles to Perdido Realty on the left (sign above entrance). Turn left at the fourth light. Turn left on 12th Ave. Turn left on Blue Angel Parkway (SR173). Travel south approximately 12-15 miles. Turn right on Sorrento Rd (SR292), Walmart on the corner. Continue 5.1 miles, cross the bridge, travel 1.4 miles to Perdido Realty on the right (sign above entrance). WE DO NOT RECOMMEND THE USE OF MAP QUEST FROM THE INTERSTATE TO THE OFFICE.